[SLEEK, MINIMAL, AND CHIC IPHONE 7] This iPhone 7 case has heart-shaped cutouts at the corners and on the back of the case, making this one of the cutest iPhone 7 case for girls. [DUAL-LAYER PROTECTION] Dual layer polycarbonate (PC) and thermoplastic polyurethane (TPU) with raised bezel protect your iPhone 7 from unwanted scratches and bumps. 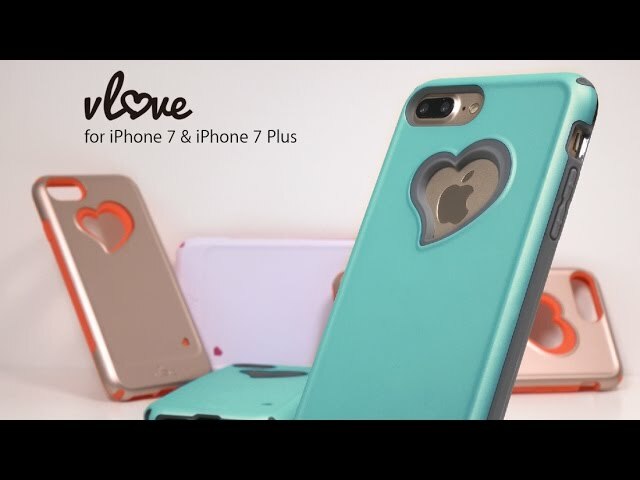 With heart-shaped cutouts on the corners and on the back of the case, Vena vLove is uniquely designed to protect your iPhone 7 while maintaining the sleek, minimalist, and chic look to your phone. 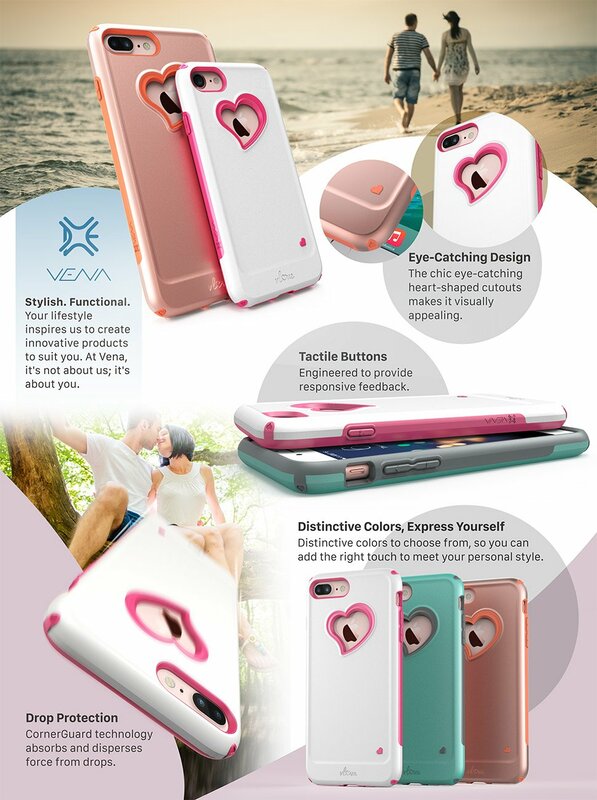 Vena vLove iPhone 7 case features polycarbonate (PC) hard shell and thermoplastic polyurethane (TPU), providing your phone all-around drop and scratch protection from everyday use. The high quality shock absorbent TPU does not stretch out over time. With CornerGuard TM technology and unique pattern, Vena vLove protects your iPhone 7 and disperses the force from shock and impact through the TPU case. Vena vLove is designed with precision cut-outs to suit the iPhone 7 and provides effort access to all ports, buttons, and features. The beveled power and volume buttons are crafted to maintain the same great tactile feedback from your phone’s buttons. Beautiful case and it fits perfectly! I love it. Seems like a durable case but the color is more of a neon orange so I returned it. I have had this case for one month and I love it! The heart on the back is so awesome! The color was perfect and I love the gray rubber that protects the entire front of the phone. I decided to place a photo where the heart is on the back and it looks great. The case fits my iPhone 7 perfectly. The cutout detail is unique. I do wish the product came in different color options, but I'm highly satisfied with my case. I have not had it long enough to comment on protection factor. It does feel just as solid as previous cases I have owned. In love with this case!! I love it! It's cute and does the job of protecting my phone well! I dropped my phone at a game onto the concrete and heard it bounce then clatter on the isle below me. When I got it back my phone was fine. 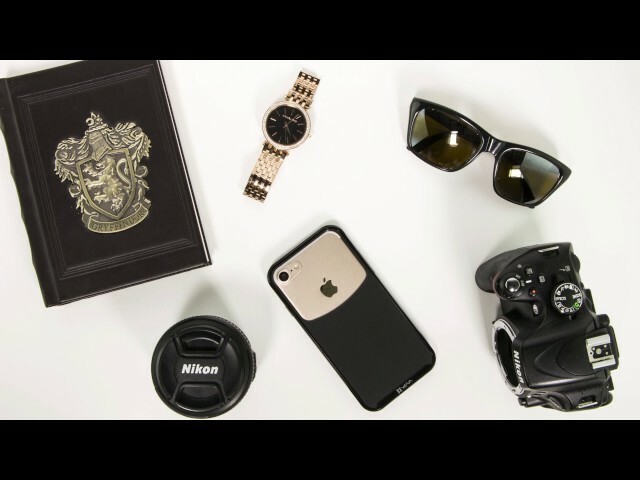 Great case! Very well constructed and has very good gripping on the sides. I never drop this phone with this case because the gripping is so good and its very well insulated even if i did. No doubt it would absorb any fall. I get so many compliments..this case looks great and is functional. Love it! I absolutely love this case. It was everything I expected and shipped fairly quickly.